Who else is glad it's Friday? It is Friday, right? It's been one of those weeks were half of everything I did went wrong. 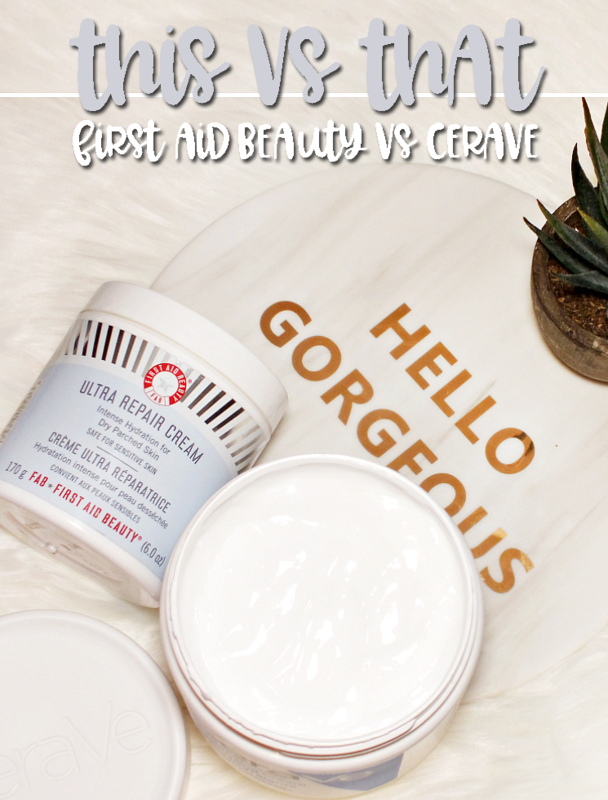 Computer troubles, batches of bad photos, products that I just got that have straight up disappeared online... and those are only the troubles I faced in putting this post together. 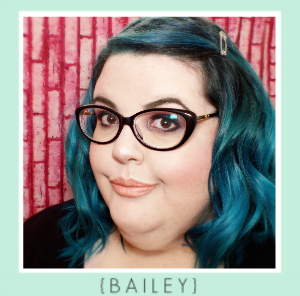 Living that blogger life isn't always good times. Oh well, I sucked it up, and am ready to chat brushes. 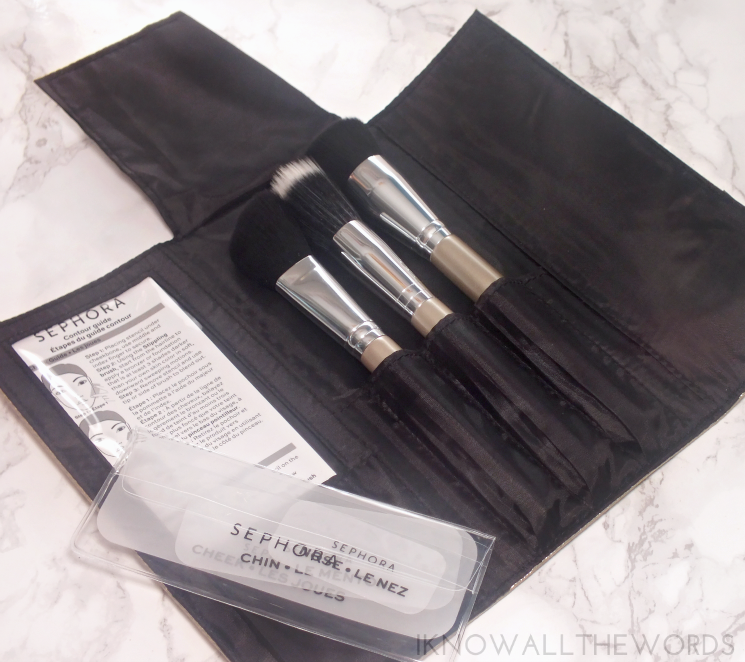 Not just any brushes, but some seriously stylish brush sets from Sephora Collection. 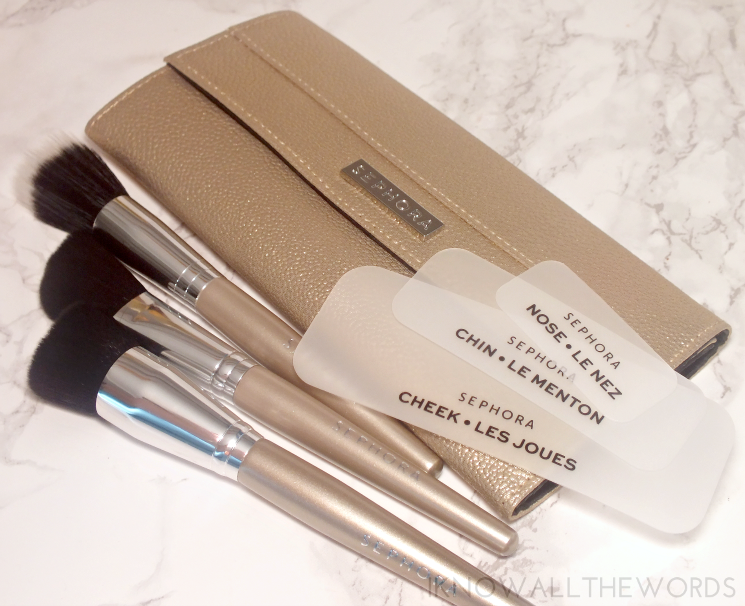 I tend to be a bit weary of brush sets, because you just never know what type of quality you're going to get, but I can happily report that Sephora does brushes right. 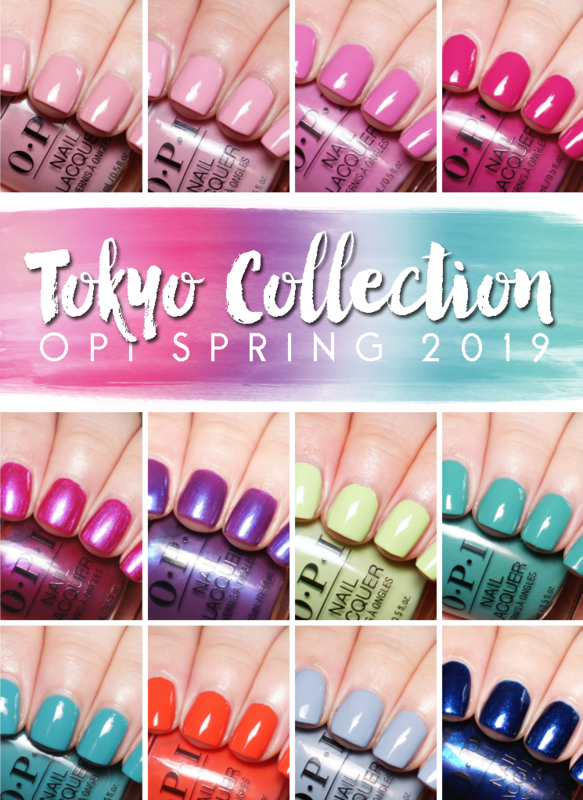 Read on for a look at a sampling of their current (and maybe not so current) offerings. Any rose gold fans? 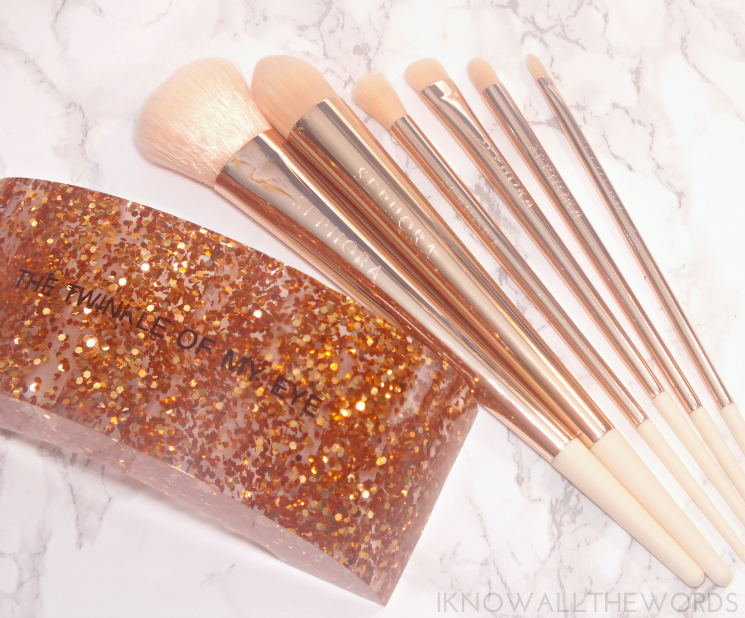 This is the set for you (or us) as the Glitter Happy Brush Set is home to six full size rose gold brushes. 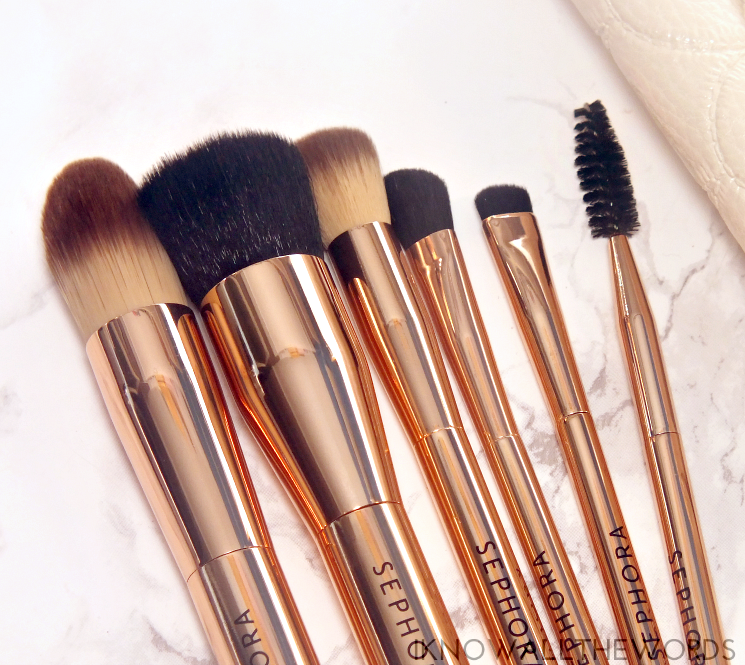 The sleek, tapered brushes are capped with a cream plastic tip for an extra touch of elegance, and the bristles have a soft peachy-pink hue. 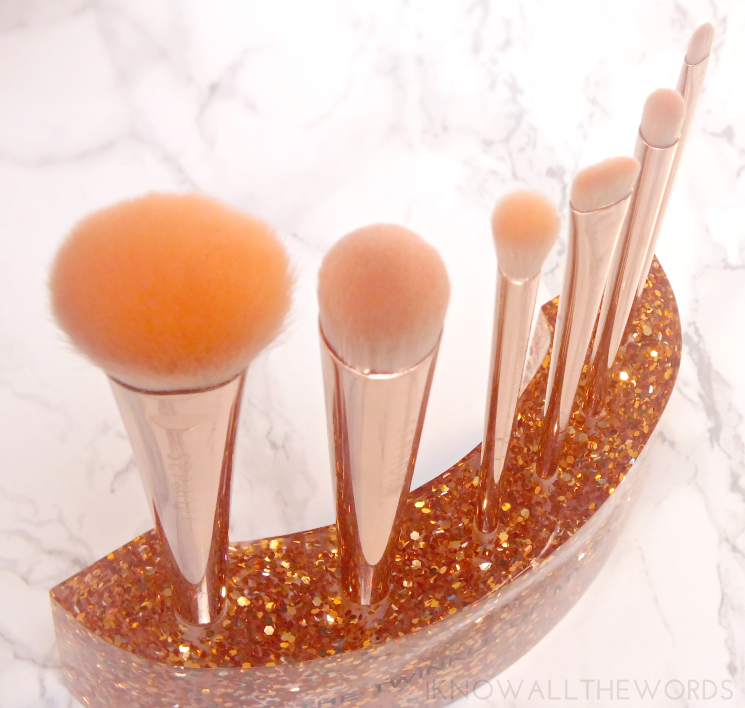 The glitter component comes in the form of a weighty brush holder made up of a clear resin-like material which has rose gold suspended within. It's amazing! The front of the curved holder has 'the twinkle of my eye' printed on it, which is a cute touch, but the font is seriously sad and takes away from the overall look and feel of the set. I say flip the holder around around so it's on the back before displaying. As for the actual brushes, you're getting a blush, pointed foundation, blending pointed concealer, all over shadow, and lip brush. All of the brushes are super soft and fit well in hand. I love that every one of these brushes is completely useful. There is little worse than a brush set with brushes you know you'll never use. 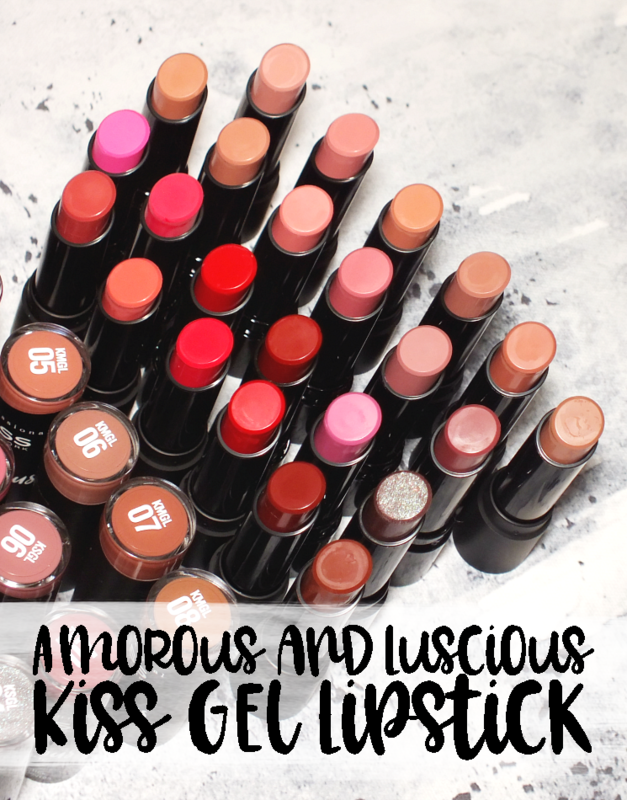 Tip- lip brushes are great for adding liquid highlight or concealer around brows if you're not a lip brush user. Some styles are also perfect for applying gel liner. The contouring trend isn't going anywhere, and as we all know, the right tools can make any job easier. The Flatter Yourself Contour Brush Set gives you all the tools (minus the a contour and highlight shade) for a perfectly contoured face. The set is housed in a shimmery, taupe-gold, tri-fold clutch with a magnetic closure. Once opened, it has a little pocket that holds a set of silicone guides for applying product. You simply hold the guide on your face and apply product above it. I wasn't sure about the guides, but they're actually kind of helpful provided you blend, blend, blend to kill any harsh lines. In the centre, there are three brush slots for the three brushes. 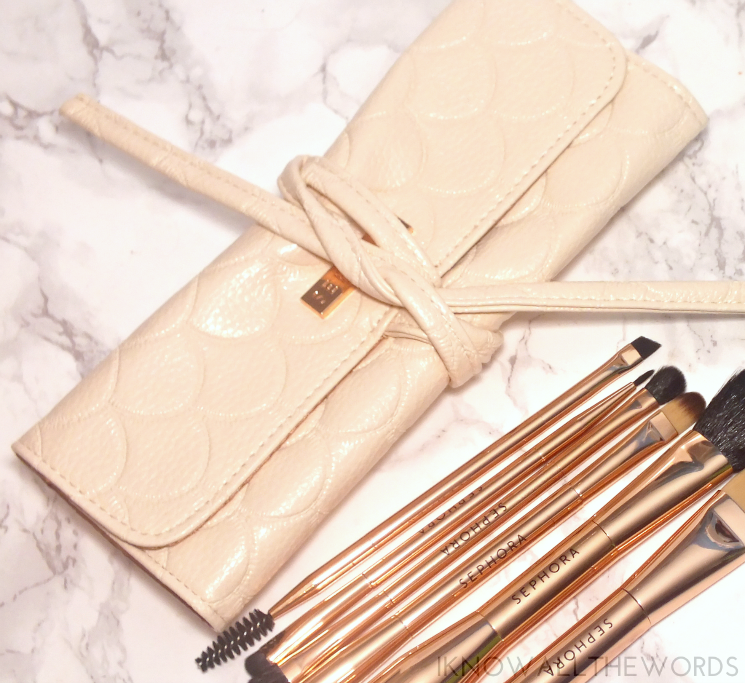 This set includes and angled blush, stippling, and buffing brush. 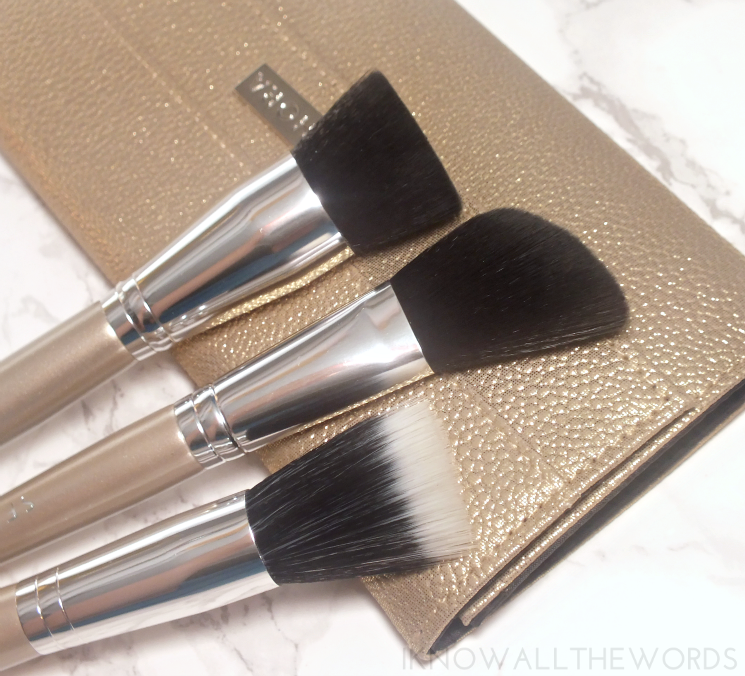 The brushes are all very soft, quite dense, and generally just good quality. I should note that all of the Sephora Collection brush sets are cruelty free, not tested on animals, and in sets with leather-look cases, use vegan leather. Now things get a little iffy in terms of availability (sorry!) I received a shipment of Fall products two weeks ago and a shipment of holiday products last week so I haven't had this set long, but I can't find it. It's not in the info packet I have, and I can't find it on the Sephora site. Your best bet is look in store because the Double Time Double Ended Brush Set is kind of perfect- and that's coming from someone who normally isn't into double ended brushes. This set is home to A LOT of brush options thanks to the fact that they're double ended. 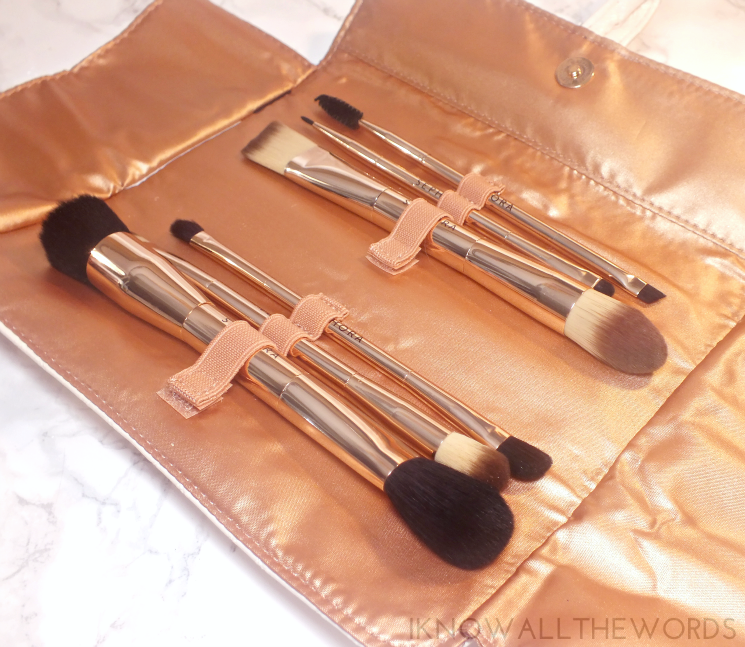 You're getting full size, rose gold handles (so pretty!) with great quality. All of the brushes are soft, dense, and feel very well made (a trend I've noticed with every set.) 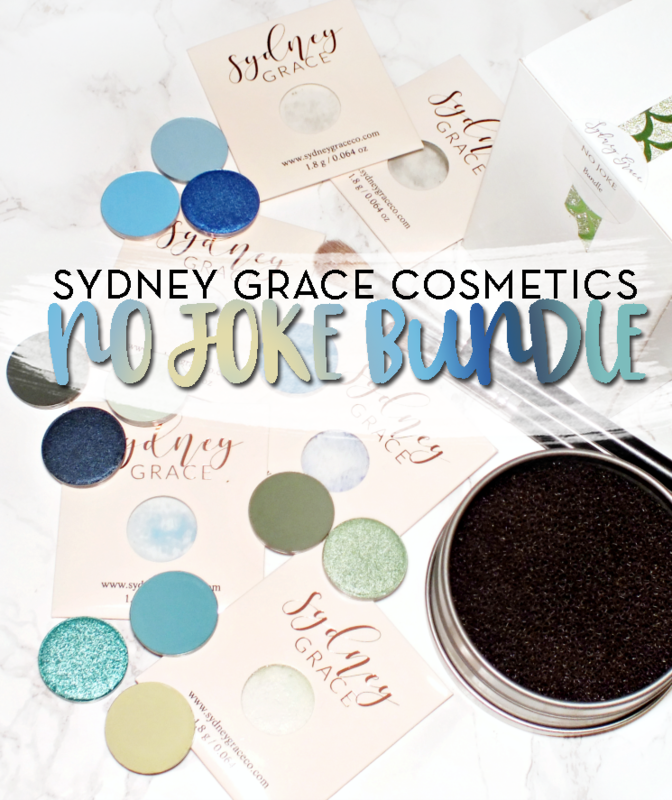 The brushes included are: buffing/blush, angled/pointed foundation, airbrush/perfecting concealer, all over/angled shadow, spoolie/angled brow, and eyeliner/smudge brush. Everyone fits into a cute cream faux-leather brush roll. The brush roll is very thoughtfully designed, as it not only snaps and ties, but there are inner flaps to ensure nothing can slide out. Plus, the elastic slots for lager brushes can be opened (via velcro) so you're not damaging any bristles removing or adding brushes. 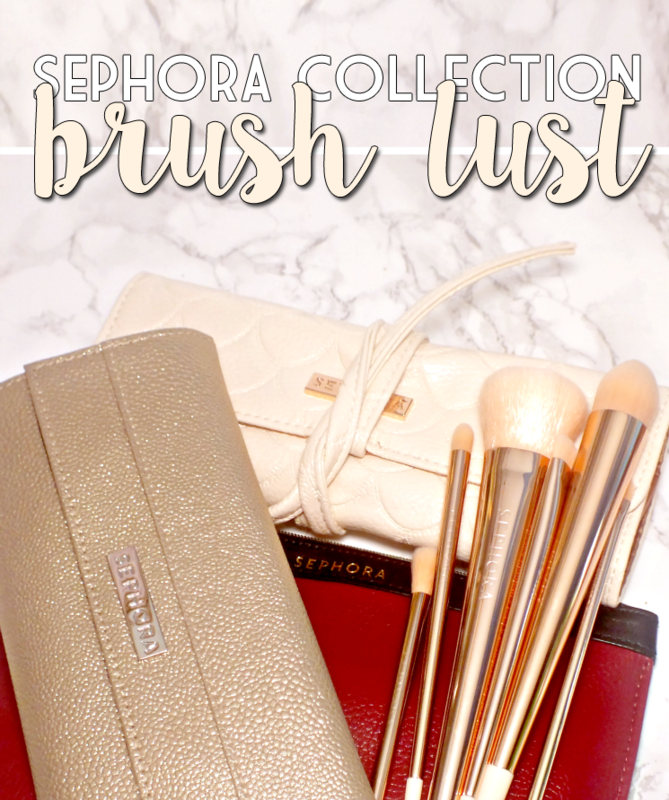 I'm pretty certain the Gold Edged Brush Set is sold out (it looks to be online) but check in store if you love it as much as I do. 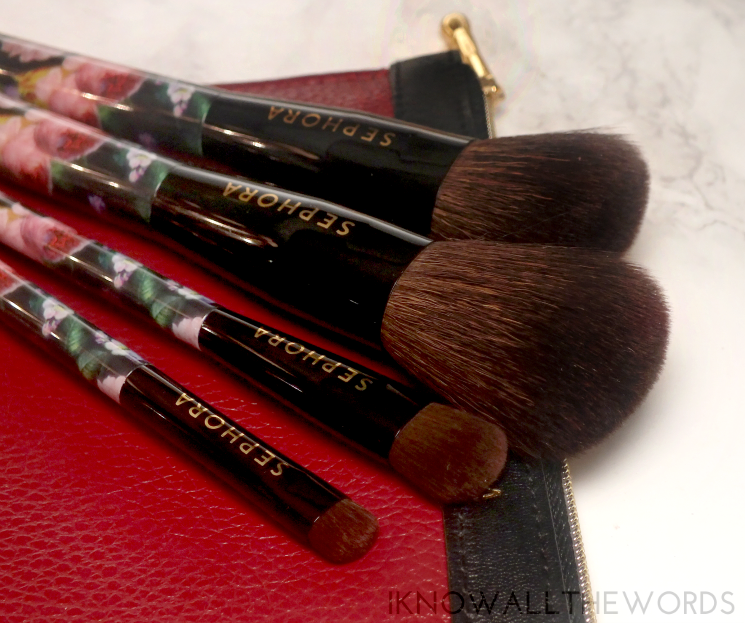 Not only are you getting four great brushes (more on those in a moment) but you're also getting a really chic pouch. The red-maroon faux leather (I kind of hate the term 'vegan leather') pouch is trimmed with black along the top featuring a small, unobtrusive 'Sephora' stamped in gold. The zipper is also gold, which is home to an adorable brush shaped zipper pull (squee!) which matches the gold corners that complete the edges. The faux-leather is super soft and incredibly real feeling. 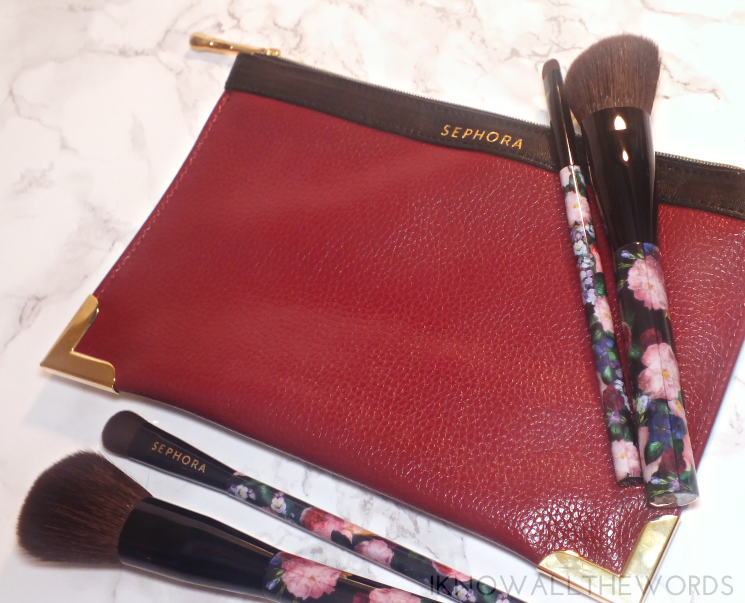 It's a really well made pouch that can actually be used outside of just makeup. As for the included brushes... They're gorgeous! I get really excited about printed or coloured brushes and these dark floral print ones do not disappoint. 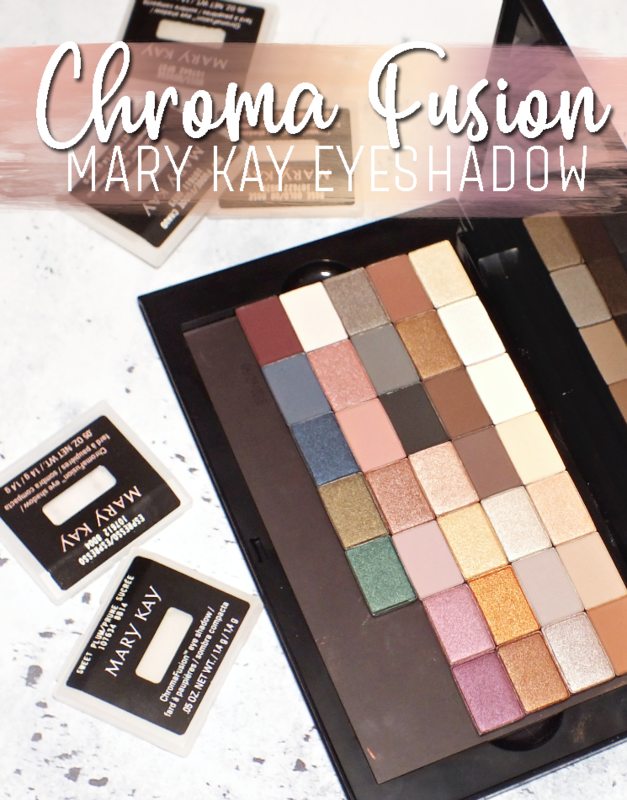 The set includes a powder, angled blush, all over shadow, and smudge brush with the same super soft, dense, and well made feel we've seen in the other sets. Unlike some printed brushes, the handles here aren't just encased with a seal heated on. The print is right on the brushes and even extends onto the bottoms. All said and done, these are some really amazing brush sets! 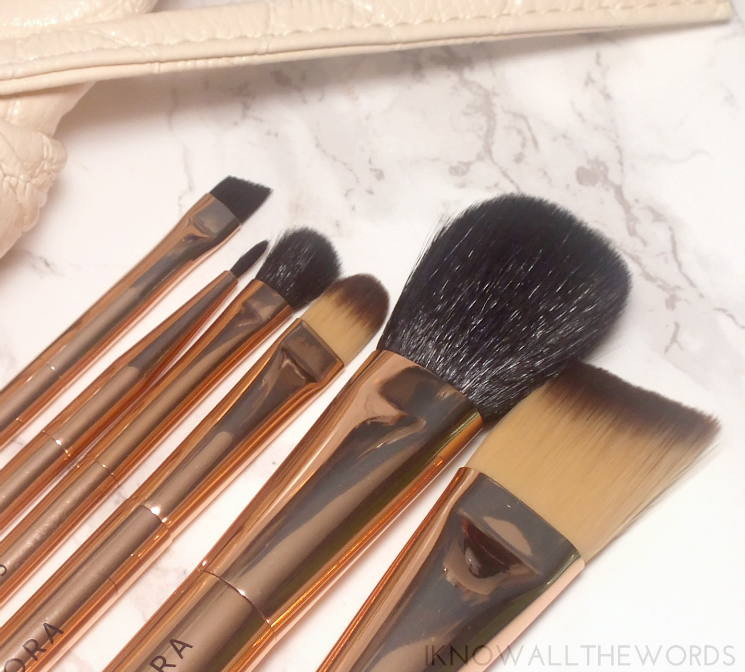 They offer up more than just a pretty face, as the brushes all perform well and feel very well made. I haven't had these long enough to have washed them though, but I can't see them falling apart (they really do have a well made feel.) 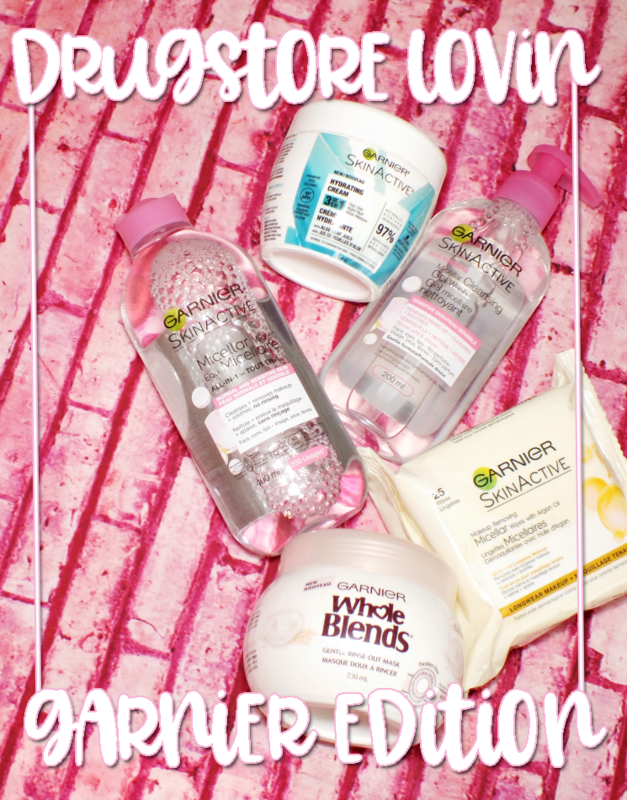 Any of these sets would make excellent gifts for beauty fans and novices alike. What do you think? 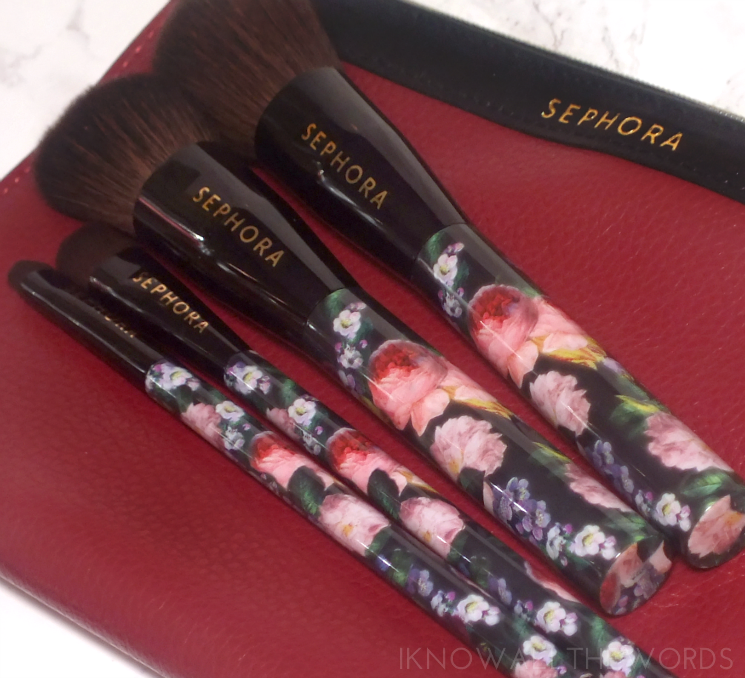 Tried any Sephora Collection brush sets? Need one in your life?